The C43 Coupe boasts a broad, single-level salon with 6-feet, 8-inches of headroom, which becomes part of a seamless indoor/outdoor living space when the glass cockpit doors are open. It also features two spacious staterooms, each with 6-feet, 6-inches of headroom, a well-appointed galley, a private owners’ head with separate stall shower, and a separate day-guest head. 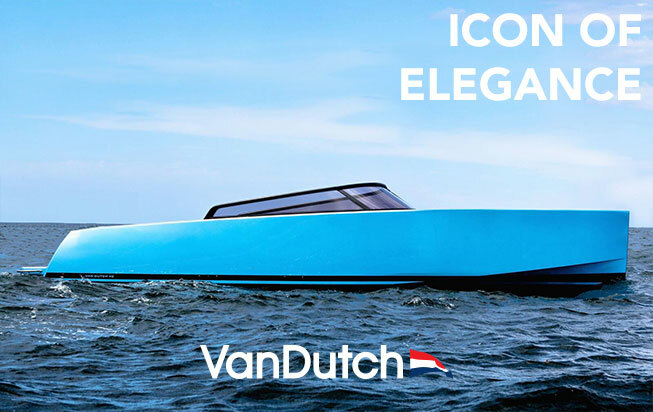 There’s abundant seating throughout the boat, an expansive swim platform, a retractable electric glass sunroof, and an available retractable sunshade. In addition, wide side-decks provide easy access to the foredeck. Provisions for optional navigation equipment including RayMarine E120 display with GPS, chart plotter, depth sounder, radar, VHF and autopilot. Lighting: Natural light provided by overhead hatch and two 5.5” by 36” hull side windows with blinds. Additional illumination provided by 2V lights recessed in the headliner and controlled by a rocker switch and two sconce reading lights. boarding ladder is installed in recessed area of swim platform. Appliances: Novacool® refrigerator, convection microwave oven, two burner electric cooktop with ventilator. Toilet: Raritan® electric pedestal toilet with freshwater flush.